Copine brings exquisite dining to Ballard. Maria Billorou. PICTURED: Jill Kinney ad Shawn McCrain delight in serving imaginative fare. During its tenure, Book Bindery was a beloved contemporary American restaurant on the north side of Seattle’s Queen Anne neighborhood. 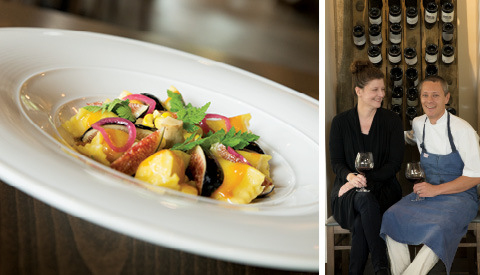 Executive chef Shaun McCrain and general manager Jill Kinney nurtured it into one of the city’s fine-dining staples. He crafted beautifully refined, French-inspired cuisine; she assembled a rock-star team and ran the house with gusto. The couple left in summer 2014 to realize their dream of opening an approachable, high-end neighborhood spot of their own. Book Bindery buffs will be thrilled to know that spot has arrived. The 60-seat Copine (pronounced ko-peen, French for girlfriend or pal) opened in July at the base of the new, mixed-use Ballard Public Lofts, and it is exquisite. From the Tom Kundig-designed open kitchen to the soothing, neutral tones of the furniture, every detail has been carefully curated, down to the tiny fork “stands” that hold McCrain’s ever-changing, innovative amuse-bouches, such as melt-in-your-mouth citrus-cured salmon with roe. McCrain’s time as sous-chef at New York’s world-renowned Per Se (2004-2008) informs much of his creativity, his edge. So a classic like foie gras ($20), tempered to a soft-butter consistency, is reimagined as a terrine, with thin layers of savory duck leg confit and cherry gelée. Pillowy, handmade agnolotti ($22), perhaps stuffed with squash or pumpkin, is topped with a veal-stock-based brown-butter emulsion cut with lemon juice to make your palate crave bite after balanced bite. Accompaniments like falafel (alongside a sensational rack of lamb, $34) are transformed, in this case with the use of organic bulgur for a moister, more toothsome bite. When the couple ran Book Bindery, many customers wanted to pick up food to go. So, while Copine is only open for dinner, it has added a cold case, dubbed Copine Project, featuring grab-and-go soups and composed salads (11 a.m.–2 p.m. and 4:30–7 p.m., Tuesdays–Fridays; noon–4 p.m., Saturdays and Sundays). Larger items, such as roast chicken or porchetta, also are available on Sundays. Seattle’s booming economy means that fine-dining establishments are continuing to open at record speed. Make sure Copine is on your list.